Imagine you walk into a meeting ready to pitch your amazing product or service. You’re hyped up. You’ve been preparing for this big meeting for weeks. As you walk through the door, you spot the prospect and make eye contact. You shake hands and she takes you to the conference room, the door closing softly. After you exchange a few pleasantries, you begin the pitch that you’ve practiced a million times. You talk about all of the amazing features and benefits that you offer. You explain how it’s light-years better than any of your competitors. You go into the cost and the return. Just as you’re getting ready for the grand finale, your prospect stops you dead. “Doesn’t seem like a good fit for us,” she says. You fumble to find words to combat her objection. You know this is where you’re supposed to find the magic words to convince her to buy. But, you feel embarrassed and nervous. You can’t come up with anything. Before you know it, you realize that you have to say something. So, you admit defeat. “Okay, thanks for your time,” you utter, knowing that you probably won’t have a second chance at this sale. Almost as quickly you walked through the door, you’re packing up your things and preparing to walk out again. “What just happened?,” you think, feeling defeated as you walk through the parking lot. You find your car and drive away. Overcoming sales objections is difficult--it can be paralyzing. The truth is that both new and experienced salespeople often struggle with these situations. It’s hardwired in many of us to not push too hard on anyone to try to get them to say yes when they don’t really seem sure. And when you don’t have a response figured out, it can be extremely difficult to come up with one off the top of your head. On top of all that, it can feel a bit sleazy--maybe even manipulative--to keep pushing someone once they’ve expressed a concern or doubt about the sale. But sales is all about these magic moments. 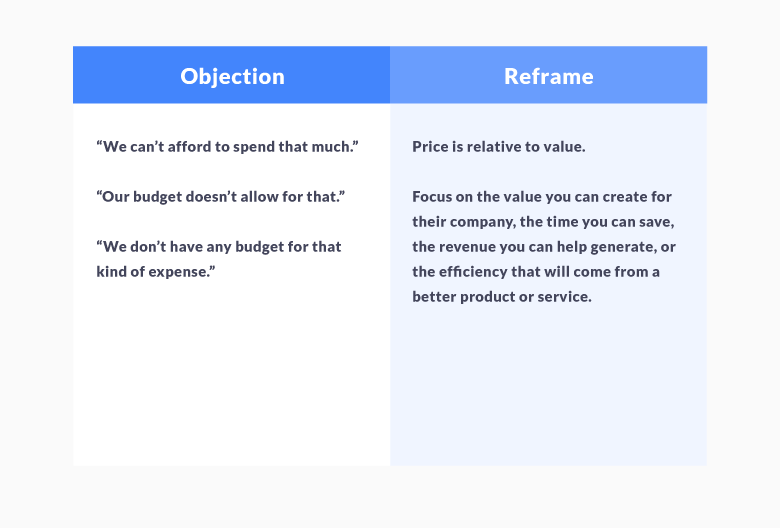 Objections are often about reframing the proposition and helping the buyer understand how you can create value for their company. Think of a sales objection like an opportunity to do a better job of selling. Unless it’s a firm and unequivocal “no” (and even sometimes then, too), chances are that an objection is not the same as a rejection. An objection is a worry or a question--it’s a concern that the buyer has and needs you to address. 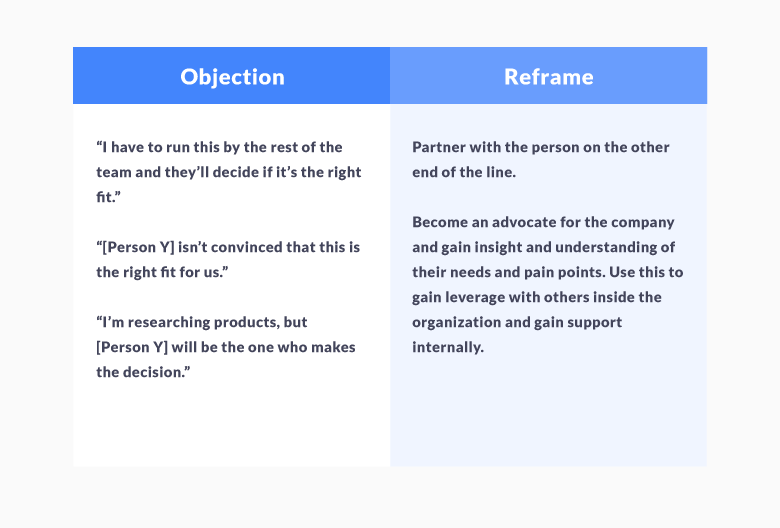 It’s about listening to the buyer, hearing their concerns, and then reframing the conversation in a way that helps them understand why your product or service will create value for them. The objection itself is not so much a roadblock as it is a road sign. When you hear a sales objection, you shouldn’t be scrambling for a way to argue the fact. Instead, you should be prepared to address the concern in a way that helps change the buyer’s perspective on the issue. And most great salespeople learn to do this through trial and error. They practice by failing a thousand times until they find just the right words to say. You can learn to meet these objections head on by preparing for them in advance. 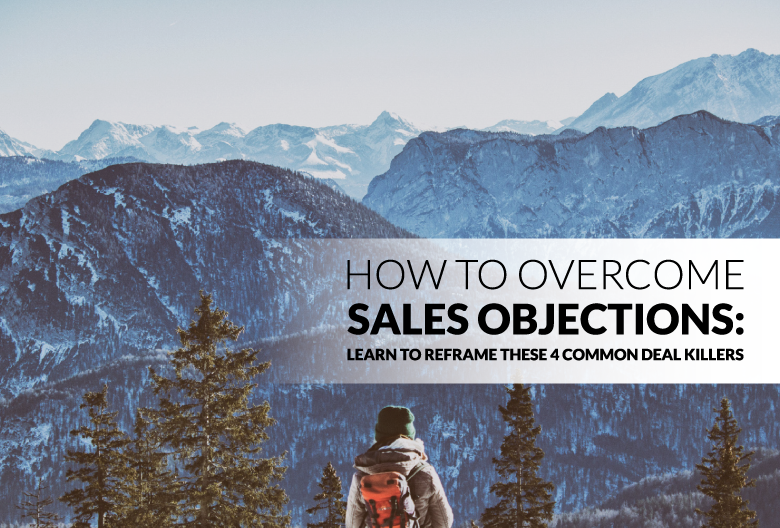 This guide will explain some of the common objections and how you can reframe the conversation to overcome a buyer’s objections without feeling like you’re being pushy or aggressive. It all starts with understanding their concerns and then understanding how to speak to the deeper problems that they uncover. Many of the most common objections that salespeople will hear will relate to price or budget. It’s an easy scapegoat to get out of a conversation or stall a sales pitch in it’s tracks. If something too expensive, then it’s just too expensive--right? In reality, price and budget objections are rarely about the cost in absolute dollars and cents. After all, businesses are in the business of spending money in order to make more money. As long as the return on the purchase justifies the cost, then it makes smart business sense and would be a good investment for the company to make. This means that it’s really about creating value. Your prospect needs to know that the purchase they are making will create more value (in terms of money, time, efficiency, or effectiveness) than it costs to buy. Then, you know that the value proposition is likely not adding up. In this case, you need to reframe the problem. Ask them about the value that it will create for the company--how much time they could save, how much more revenue they could generate, etc. These questions will likely open some doors for how the deal will make financial sense for the company. It can help solve their revenue or cash flow problems that may be holding up the deal. In some cases, it’s a true blocker--if the company really does not have the revenue or cash on hand to buy, then you should try to get to that answer as quickly as possible. From there, follow up periodically to see if the company is growing and find the right time for them to revisit the purchase. Another common type of objection that you will hear in the world of sales is about competition or switching costs. You’ll often be either trying to replace an existing solution or the buyer will be shopping around and looking at multiple products or services. They’ll often do an analysis of each possible solution, evaluate the costs of switching, or try to forecast the long-term benefits and costs of each option. 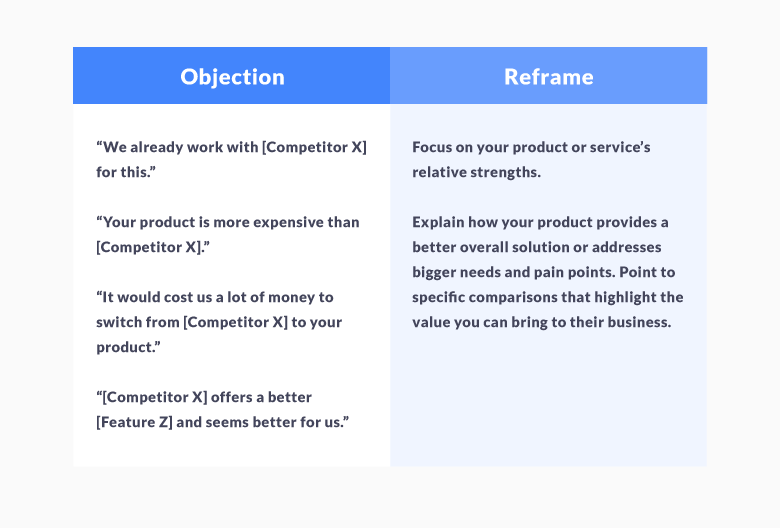 Your product or service can’t outstrip every competitor in every single way (usually), so there are three basic ways to respond to these kinds of sales objections. It may take some time to understand the right response in these cases. As you experience these objections more, you’ll start to understand patterns as to why or when prospective buyers reference competitors. From there, you can learn how to defuse their specific objections about particular features, barriers to switching, or pricing. Many companies create a “kill sheet”, basically a reference sheet that compares the product to competitors and offers ways that your offering is superior. This can be extremely valuable when you’re selling and someone compares you to other companies. In many cases, a prospective buyer will state they can’t pull the trigger on the purchase. This may mean that they have to get approval from someone else in order to make a deal, or that they truly don’t have the authority to make the purchase. When these objections come up, many salespeople will quickly try to claw their way up the ladder--ask for the person who is responsible for such buying decisions. But this is a huge missed opportunity. Try to partner with the person you are speaking to now so that they will become an internal advocate for you and your company. This will also give you a huge opportunity to learn about the company’s current position from multiple perspectives. Then, when you’re able to speak to the person who can authorize the purchase, you will already have a strong understanding of their needs, pain points, and even some of the objections that will be coming. Lastly, some objections will center more around the specific fit or need for the product. There’s no doubt that your product or service will not be the right for everyone. So, you should listen closely to these objectives and really seek to serve the needs of your prospective customer. If it’s not a good fit or you can’t meet their needs, then be quick to recognize that. On the other hand, many of these objections often come from a simple lack of understanding or from a prospect feeling their needs are not being addressed. Meet these objections with questions. Seek first to understand the needs of the customer and then assess whether these are true incompatibilities or simply minor roadblocks to purchase. 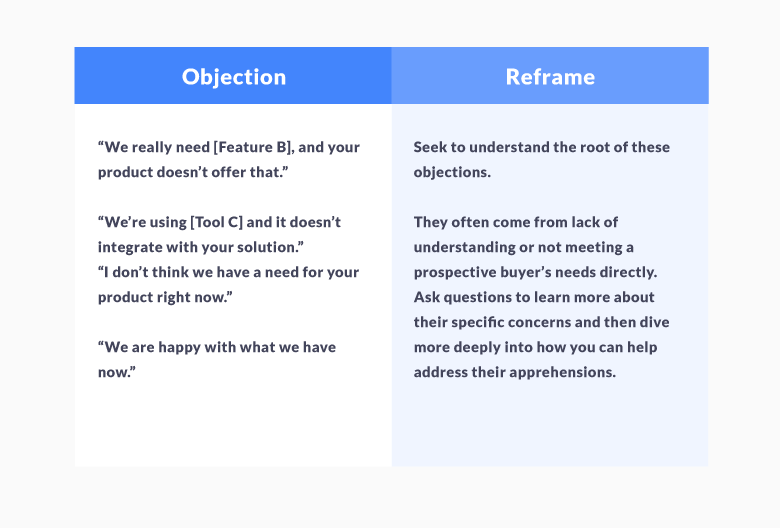 In many cases, you can understand why these objections exist and that will lead you to ways to reframe the conversation to address those concerns. The most important thing to keep in mind is that objections are rarely rejections. In many cases, the sales process is about understanding and overcoming objections. They’re part of almost any sale. Don’t be discouraged if your pitch it met with objection. Instead, embrace the opportunity to learn about the needs of your buyer. And learn for future sales how you can better speak the language of your prospective customers. By facing objection, you’ll become a better salesperson. Even if selling doesn’t come naturally to you, don’t let the prospect of an objection scare you away. Listen closely, learn a lot, and solve the problems that your customers face. In the end, you’ll be able to close more deals and everyone will be happier and more successful.